Since we did some garden cleanup this week, I thought I’d share some of those photos. It is always sad to pull out plants, but it is nice when the garden looks clean too! The first thing to go was the tomatoes. The plants still had a number of tomatoes on them, so we picked them off. 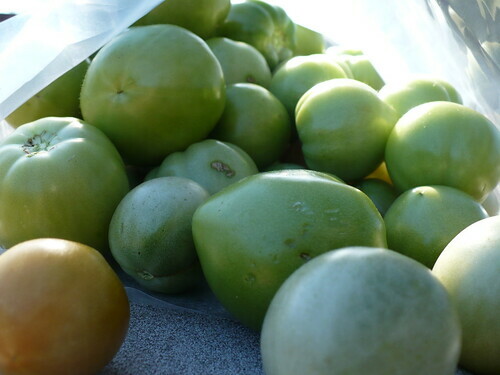 We ended up with about 5 pounds of green tomatoes from all the remaining plants. Some of them will still turn red, while others probably won’t. I suspect I’ll have to find a couple green tomato recipes to share. I think I’ve discussed my propensity for trying things just to see what will happen, right? Well, this is one of those cases. 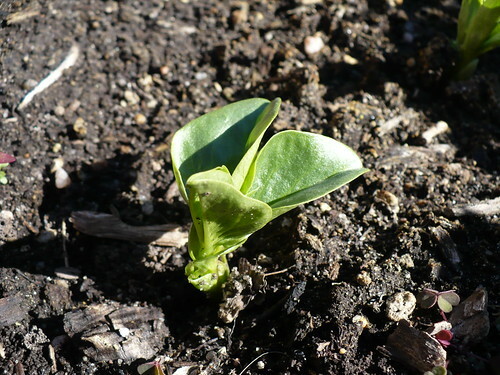 I had a few fava bean seeds kicking around, so why not throw them in on October 15, just to see how they survive the winter? Oh yeah, and let’s put them in the cold bed with the spinach, rather than the bed with the plastic. I’ll be very surprised if we get any fava beans next spring, but hey…who knows? 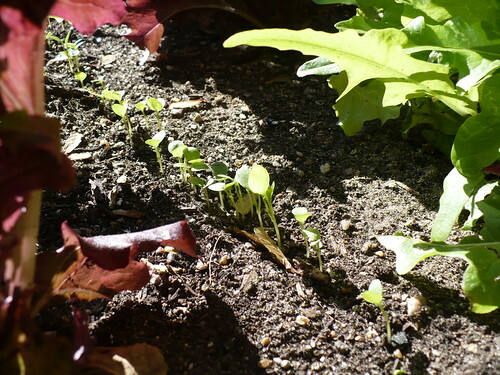 Along that same line, here’s the little larkspur seedlings in amongst the lettuces. So far they seem quite content with life. I wonder how they’ll look in a couple weeks? They are supposed to be very hardy, but I’m afraid they’re still too small. 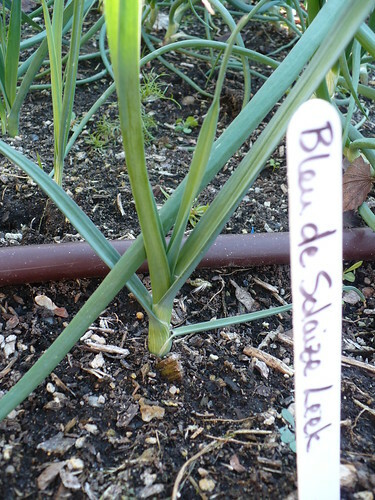 The leeks and onions are looking good, especially the leeks. It is rather amazing that they were such tiny, wispy little plants two months ago, and they still have a long way to go before they reach full size! The vegetables aren’t the only things enjoying the long, fairly warm fall. The weeds are having a blast too! 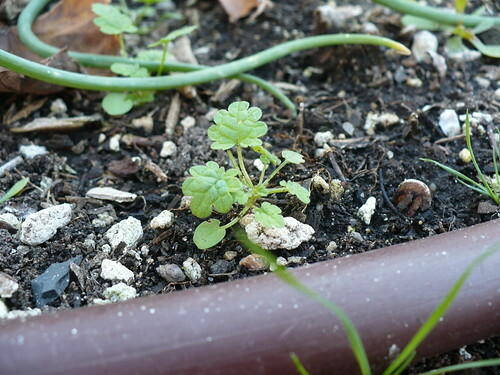 We’re seeing a lot of little henbit seedlings popping up around the garden. Can you believe that it’s going to be November come next Monday? I’m still not sure where September went! That said, it looks like we may actually get down to some freezing temperatures here in South Central Kansas…in a couple of weeks. We’ll see if the forecast holds! 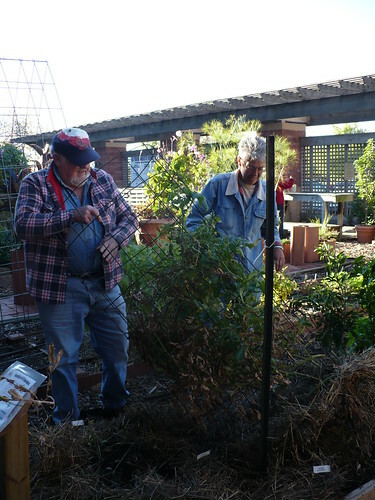 Since there is ostensibly colder weather (under 40 degrees) coming soon, it is time to think about making use of any remaining warm season plants in the garden. Now temperatures between 32 and 40 will not kill most tomatoes, peppers, basil, etc, but they will be damaged. Basil especially will start getting ugly black spots on it after being exposed to cold temperatures. So, what to do with you big, beautiful basil plants? While nothing is quite as good as fresh basil, there are several options for preserving basil. I tried a couple out last night, and I’m going to try a couple pesto recipes tonight. Now, before you get upset because you don’t have time to make pesto tonight, don’t despair! You can pick your basil, and store it in a bucket with water or a vase, just like a bouquet of flowers. The basil will last for a few days in the water, until you can get to preserving it. This is definitely the easiest way to store your basil. 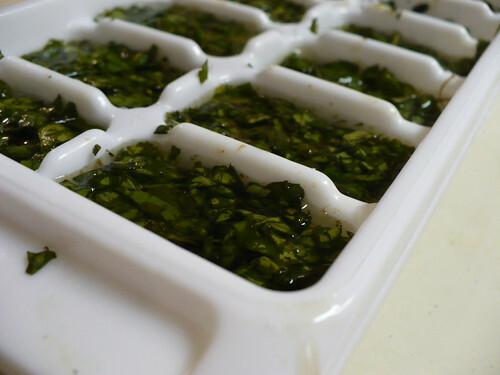 All you have to do is chop it up (in a food processor), then put some of the chopped basil in each well of an ice cube tray. Simply cover the basil with either water or olive oil, and stick the tray in the freezer. After the basil cubes are frozen, pop them out of the tray and into a plastic bag. That method is really easy enough. The basil cubes will be easy to drop into soup, sauce, salad dressing, etc. Really? Yes, really. 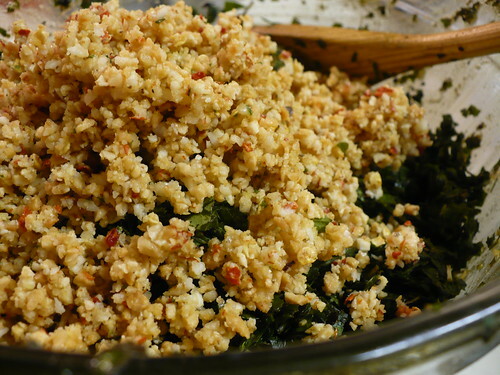 I happened across this method while I was looking for pesto recipes, and I thought it was intriguing enough to try out. 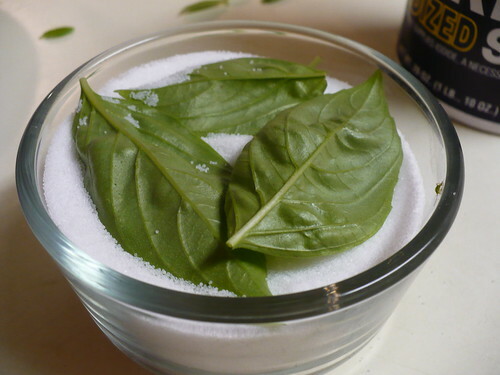 Supposedly storing the basil leaves in salt gives you the closest resemblance to fresh basil of any method. 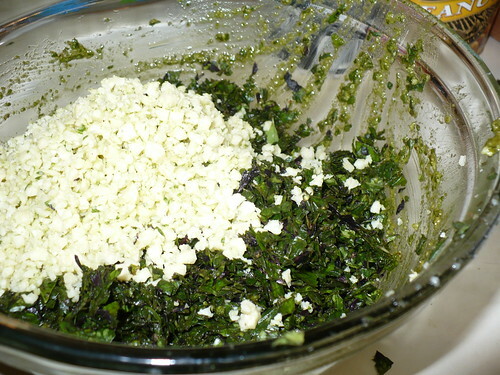 You layer leaves of basil with salt in an airtight container and then store it in the refrigerator until ready to use. We just tried this with a little ramekin, since we didn’t want to use up much salt or take up much refrigerator space. We’ll see how it turns out! Tomorrow we’ll look at making pesto and drying basil. We planted some sweet potatoes in one of the ornamental gardens on our ground – both ornamentals and regular edible types of sweet potatoes. Specifically, they were in our EarthKind Soils demo area, where they were planted in a clay soil that had been amended with expanded shale and compost. The beds were minimally watered all summer, and there were times when the plants were kind of wilted.You might think that would mean that we ended up with small sweet potatoes, right? Wrong! Okay, so these aren’t that big. They are nice potatoes though! These are bigger! 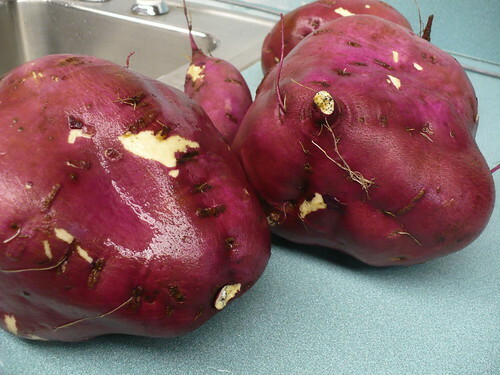 The variety is some type of Japanese sweet potato that has a bright purple/pink skin and a very pale flesh color. I was kind of surprised at how round-shaped they are, instead of the more oblong shape we expect to see. 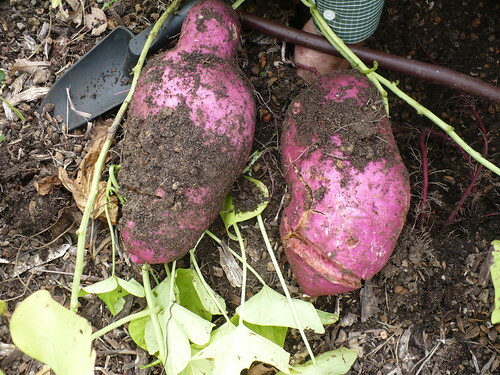 We also pulled out one of the lime green ornamental sweet potato vines and found these two potatoes! They were badly cracked, but still pretty impressive. 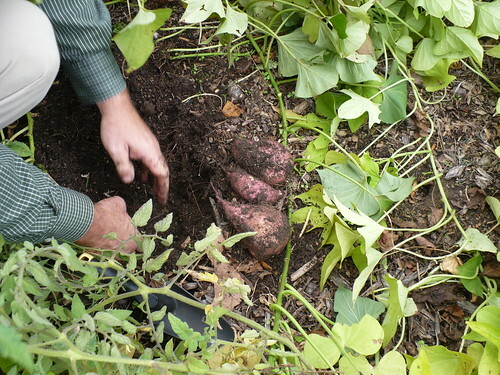 Generally, the sweet potatoes grown under ornamental vines are edible…but not very tasty. They were bred for the ornamental characteristics, not tasty roots. When harvesting sweet potatoes, it is important to let them air dry for a couple hours before you do anything with them to help the skins heal a bit. You can see in a couple of the pictures above that the skins were damaged when we tried to wash them right away. Sweet potatoes also need to be cured for a couple weeks to improve their storage life and eating quality. Curing helps convert more of the starch to sugar, so they taste sweeter. They should be cured at temperatures of 80-90 degrees with high humidity. You may not have a spot that easily meets those conditions, so you can store them in the warmest spot you have with the potatoes in a perforated plastic bag to keep the humidity up. Under those less-ideal conditions, you might need to cure them for 2-3 weeks. After the curing stage, they can be stored in a cool, dry place until you are ready to use them. Apparently I failed at publishing this last Friday. I swear I hit the right button, but the computer didn’t think so. It’s amazing how much faster things grow when you are away for almost a week! It has been 7 1/2 weeks since we planted a lot of the veggies in one of the two winter trials. Everything is looking great! Of course, it is still pretty warm, so the growth of most of the plants really hasn’t slowed down much. 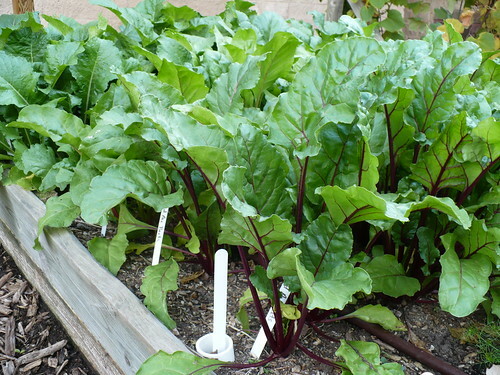 The beets planted in the fall trial garden are looking great! 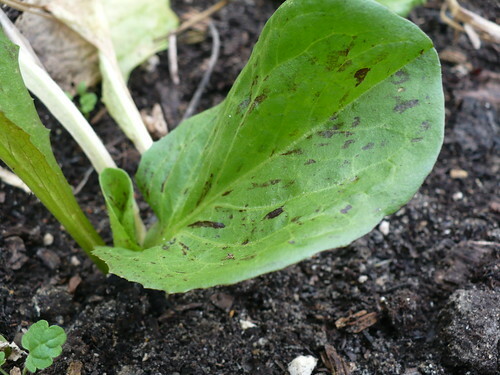 Dark green leaves, no disease, and the beets are beginning to size up. The gold beets are a little bit shaded out, but the red beets are going to be winners. I’m not sure what to make of this plant. 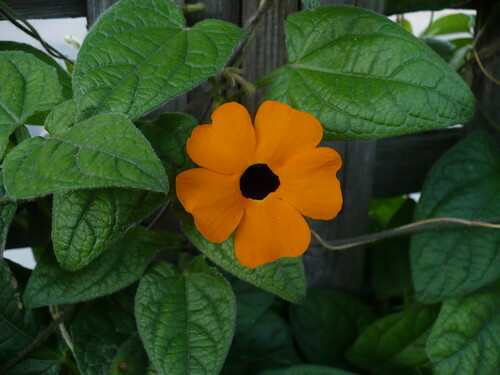 It is a Thunbergia Vine (sometimes called Sunflower Vine). Everything I knew about it indicated that it should thrive in the summer and have lots of blooms. However, the vines were slow growing and it has just recently started having a few flowers. There must be something about the spot it was planted in that it didn’t like. Do you know what that is? 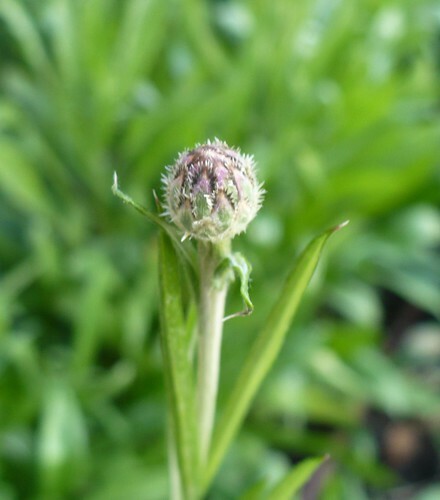 If you guessed that it is a bud of a Bachelor Button, you’d be right! These plants are definitely benefiting from the long, warm fall. The radicchio I transplanted last week has really taken to it’s new spot! Each plant has 2-3 new leaves that are darker green, thicker, and overall healthier. They are even starting to show some of the red streaks. The ‘Yummy’ Pepper plant is loaded with peppers that are very slow about turning orange. 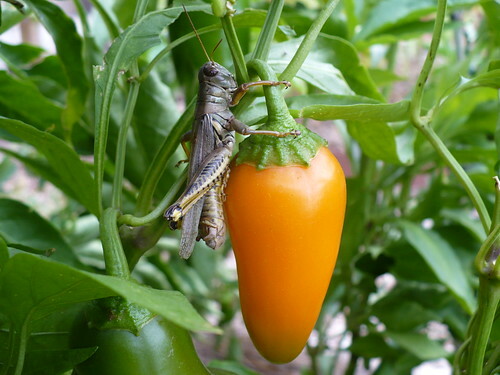 At least this grasshopper is using the pepper as a landing pad and eating a stem of the plant rather than eating the pepper itself! Many of our annual flowers are done for the season, but this lantana is still looking great. 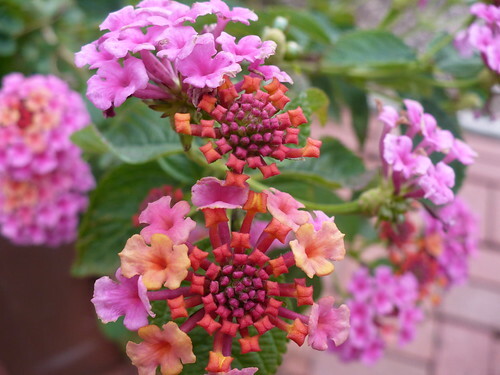 Lantana is such an interesting flower, with the florets opening from the outside to the center and the colors changing as the flowers age.